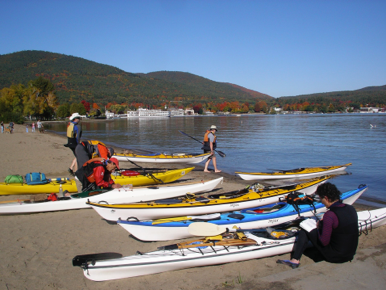 October 2008: Last year Bruce and I and a small group of Vermonters met at Huletts Landing on Lake George’s eastern shore for a two-day paddle late in October (Click here to link to that trip report). We had such a good time that Bruce initiated the planning of a similar trip this year. (Photo above: Bruce, Alan and Don - The three Amigos, or is it the Three Stooges?) 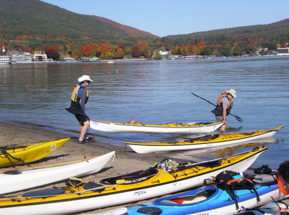 Bruce thought it would be fun to do an end-to-end paddle of Lake George, starting at the Million Dollar Beach in Lake George Village and ending at Mossy Point in Ticonderoga. The distance is twenty-eight miles as the crow flies; thirty or more miles of paddling, depending on just how much sight seeing you to do. Columbus Day weekend was chosen because it would give us three full days to complete the trip, should we need it. Bruce put out an email to those who had paddled the year before, and to a few selected others. Soon a number of different individuals began to show some interest in the idea, and word of mouth connections began to happen. The number kept changing up and down until it began to jell around about seven people, four from Vermont, two from New York and one from Pennsylvania. As the planning progressed, different needs began to assert themselves. Three paddlers (I was one of them) could only devote two days to the adventure, while the remaining four wanted to do a three-day trip. With emails containing everyone’s needs and desires about the two or three days we would share together flying back and forth, Bruce was getting pretty frustrated. I sent one too many suggestions and got a hilarious tongue-in-cheek email from him just before the trip that sums up the state of things at that time. Saturday, October 11: Anyway, on the appointed day I met Bruce and Alan Lovgren at the Interstate 87 rest stop just past Exit 9 at 7:00 am. Alan was driving his big SUV with both boats on top. We caravanned to Lake George Village, arriving sometime before 8:00 am. Neither Bruce nor Alan had had any breakfast, so we hunted for some food, finding a diner open. I had a fourth cup of coffee while the guys downed their eggs and oatmeal. Then we found the Million Dollar Beach and unloaded the boats and gear. As soon as my boat and gear were unloaded on to the beach, I jumped back in my car and headed for Mossy Point near Ticonderoga at the north end of Lake George. 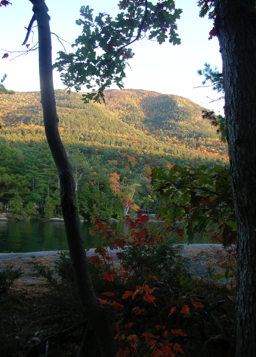 There I would meet Ruth Miller and Frank Montbriand, both Vermonters. I had met Ruth on this year’s GHRP. Frank I had yet to meet. I didn’t have exact directions, but I figured my GPS would get me close. It got me close, but mislabeled streets caused some confusion and delay. Ruth and Frank were waiting when I finally arrived. 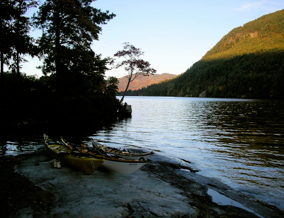 Both of their boats and related gear were piled on top of, and inside Ruth’s 1997 Toyota RAV-4. They had carved out a spot for me on a rear seat. I parked my car and left a note for the park police. Then I hopped in the RAV-4 and off we went back to the Million Dollar Beach to begin our adventure. By the time we got back to the Million Dollar Beach, Karl had arrived, bringing another fellow, Phelps along. All the Vermonters seemed to know Phelps, but the rest of us did not. We hadn’t heard too much from Karl and weren’t even sure he’d show up, but he did and with a friend! Now there were seven of us: myself and Bruce Romanchak from the Albany, New York area, Alan Lovegren from Philadelphia, Frank Montriband from Ticonderoga, Ruth Miller and Karl Riemer, both from the Burlington, Vermont area I believe, and Phelps Holloway, also a Vermonter. We set out at about 10 AM with the goal of covering about twenty-miles before finding a place to camp for the night. Our route would take us along the less developed eastern shore of the lake, past Pilot Knob. We stopped for lunch at Phelps Island (in honor of Phelps, of course). Then paddled past Sandy Bottom and Log Bay, jus t across from Bolton Landing and the Sagamore Hotel. We skipped past Northwest Bay, staying east of Tongue Mountain and west of Shelving Rock, passing through the beautiful Narrows area of the lake. This is where the lake narrows down, pinched on both sides by mountains. The Narrows is filled with a labyrinth of islands big and small, making it a paddler’s paradise. We passed Big Burnt Island, our camping spot on last year’s trip, then headed out of the Narrows toward the Mother Bunch, the next cluster of islands a few miles ahead. It’s interesting to see the patterns that develop among paddlers on a long paddle like this one. Initially, people stay close to the folks they know, then the group starts to break up into other groups of two and three. There’s easy conversation as we get to know each other. Sometimes we paddle off by ourselves, getting into our own thoughts, then someone paddles up next to us or we paddle up to someone else and begin more conversation. There’s time for all of this on a long, relaxed and easy paddle like today. 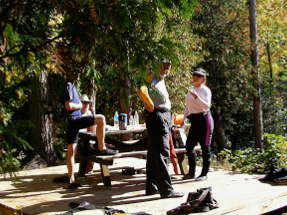 could camp on any site where a dock had been pulled without a reservation. Our job was to find a dockless campsite with a reasonably easy take out. This is more difficult than you might think in these islands, as they are all rockbound, with very few beaches or even low rock formations to beach a kayak on. After some searching we found two suitable sites on the most northerly and largest island in the group, St. Sacrament Island. 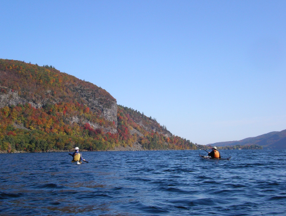 We had covered nineteen-miles in what seemed like an effortless paddle on a beautiful, crisp October day with the colors in the mountains near peak. Perfect! 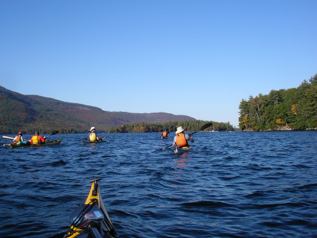 To this day, Lake George remains the picture of what an Adirondack Mountain lake should be. However, during the season (June-August) it’s no place for human powered craft. The lake is overrun with tens of thousands of powerboats. By October, things have settled down to where paddlers can enjoy the lake and it’s beauty without the constant agitation of powerboat wakes, or the constant threat of being run over. We sat for a moment, stunned. These boats couldn’t race like that during “the season”. There would be too many other power and sailboats on the lake. It was sobering to believe that had we been crossing the lake at that moment, the chances were high that one or more of us might have gotten hit. The powerboats sat high out of the water. They had long decks and were traveling at sixty or more miles per hour. They were very intent on their race and on catching the leader, and all the spray they were throwing up limited their visibility. Hitting one of us would have been like hitting a wide seam joining two pieces of highway - a small bump, a slight noise, then nothing but the roar of the engines and the whine of the propellers. 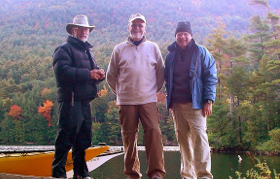 At St. Sacrament Island, Alan, Bruce and I chose a campsite on the southeast corner of a small bay. Ruth, Karl, Frank and Phelps were in an adjacent south facing site a short walk away. There was a small tent platform on our site, which Alan and I grabbed while Bruce set up next to the platform on the only spot of level grass to be found. Alan was intent on cooking for everyone. He pulled out his stove and cooking gear and got to work, even before his tent was completely set. First on the menu was clam chowder. Only a few of us wanted it, so we had our fill. It was great! Then he began to boil pasta for pasta with vodka sauce and clams. Soon, Alan found that his pots were not big enough for the job, and neither Bruce nor I had brought such equipment because Alan was cooking. So, it took quite a while to get it all cooked. As the pasta boiled and expanded, it crept closer to the top of the two pots Alan was cooking in. He kept turning the pasta over and pushing it down to get it into the boiling water below. In the end, it was fine. Pictured from the left seated: Phelps, Frank, Ruth. Standing at center: Alan. Bruce is in the background. Though we offered to share with everyone, we discovered that at least two members of our group were vegetarians (Karl and Phelps if I remember correctly). They had brought their own food, which they prepared at their campsite. While I admire the dedication of the vegetarians and vegans I know, I must admit that some of the juices and other concoctions they bring on these kayaking trips appear singularly unappealing to me. 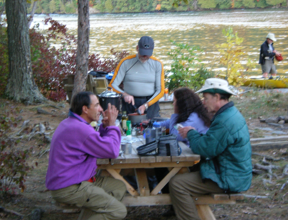 After dinner, Frank, Ruth and Phelps joined us around a blazing campfire for stories and shared chocolate. It was a beautiful night, not too cold, with a beautiful fall moon shining in the sky. It occurred to me that I hadn’t seen Karl since right after we arrived. 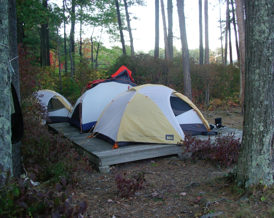 I had walked to the campsite he had staked out before the rest of the Vermont crew had joined him. Karl had spread out a plastic sheet in a far corner of the site, and placed his sleeping bag on it. I guess this makes Karl a minimalist, “fast and light” camper. About the time I noticed that Karl was missing, Bruce wandered back into camp from one of the many walks he takes. Bruce doesn’t sit still well. Walking is one of the ways he deals with his restlessness. Bruce told of the scare he just had when walking through what he thought was an empty campsite. As he walked through in the near dark, he noticed something large, dark and somewhat shapeless on top of a picnic table. Curious, he cautiously came closer and was startled to be looking directly into Karl’s upturned face. Apparently, Karl moved his sleeping bag to this site either for quiet or privacy, and was sound asleep on his back with just his face sticking out of his mummy bag. Through the night and next morning, Karl continued to keep to himself. We didn’t see him until about launch time on Sunday. About 9:00 pm, people began to turn in. Soon the camp was quiet. The moon shown through the window in my rainfly. A coyote howled far in the distance. The last thing I heard before sleep was the raucous call of a screech owl in a nearby tree. Yackman’s Note: I had intended to place this whole trip report in one blog. The number of photos I made the report too long, forcing me to split the blog into two parts.